July9, 2012.Taboona, myself and the cart left the Rainbow Springs Cabin (where we were staying) at 6 am and it was already hot! This was Taboona’s first long distance journey and like every horse I have known so far; she was living precisely in the present moment not unlike a two year old child so I was busy keeping her on the road. From Ownby Road to Old Mountain Road to Badger Gulch Road to Woodland Road we just kept going. Along Woodland Road a woman on a motor cycle, on her way to church, stopped and complemented me on my “out fit”. She liked the fact that I was not using a bit, just a rope halter but recommended that I use a ‘side pull’ bit- less bridle of some kind. She believed that would be less confusing to Taboona. That is what she uses, she said. I thanked her and we kept on keeping on. Her comment made a lot of sense to me and I will maybe try it sometime? It was so hot by the time we made Bickleton Hwy that we pulled into Neil Schlater’s horse arena and I tied her up in the shade of the building and looked around for Neil or anyone. I was not sure who lived in the trailer house but later his son came out and scolded me for not notifying him of my presence! I apologized the best I could and he allow us to rest there. I got water for Taboona and then fell asleep for a few minutes in the ever shrinking shade. It was over one hundred degrees (Fahrenheit) a crackling unmerciful heat that I actually enjoyed because of the long cold and damp winters! We left there feeling a little better but not without a residue of being scolded in such intense heat! We headed west on the black top because the gravel roads I really wanted to take were out of the question with out protection for Taboona’s hind feet! And this was really too bad because Don Bryon my “bare foot” horse trimmer, friend, had the boots I had ordered but I did not know this until we reached Trout Lake! Going at two miles an hour or so I realized there was a lot more traffic on Bickleton Hwy than I ever imagined; a vehicle passed us about every 5 minutes! We made it to Goldendale about 3 pm. I had no idea where we were going to camp and I was pretty nervous about it. Because of the sheer exhaustion and the 100 plus degree heat, we crossed the main drag, going strait west and in a couple of blocks we pulled into a vacant lot that had a vacant, wood sided, building, just behind the Motel. I unhitched her, put her on picket line and took a rest in the shade of the old building. The shade did not last long so we went looking for water. I led her strait north to the Little Klickitat River onto some uninhabited land. We made a loop to the west and came out on Pipe line Road where I saw the public park sign with the picture of a horse! So I staked here out there in what looked like the best feed and I rested in the shade of some big cotton wood trees. After a few hours I needed to go to the store and do a little food shopping so I tied Taboona up short,to a tree because I did not want to take any chances that she might get spooked by a dog or something and get tangled in her picket line while I walked to the store. But I should not have left her unattended! 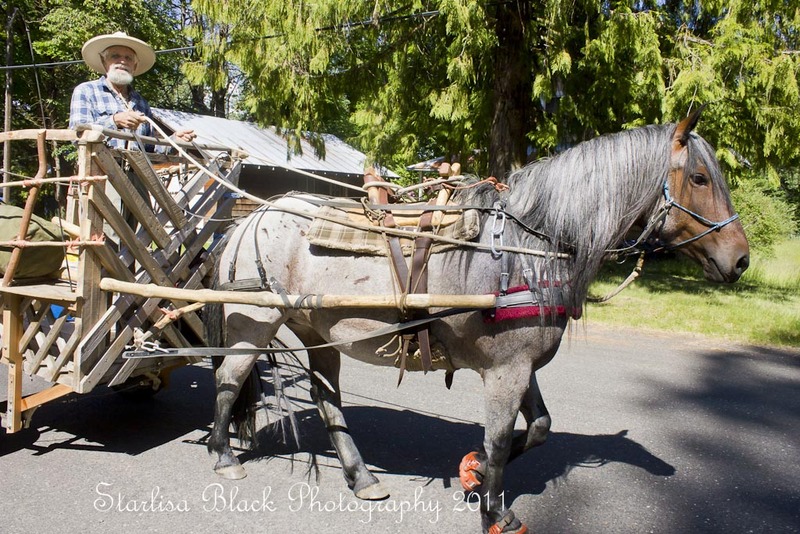 About 20 minutes later when I returned from the grocery store, the Goldendale City Police were there and a tall lanky teenaged girl with blue hair was holding my horse! The police man was relieved that I had showed up! This young lady had untied my horse, rode her around, then took her to water, then called the police; thinking that Taboona was an abandon horse! When I arrived they were making arrangements to take her to the local veterinarian’s facility!